Now many of us have to journey some distance to see one of the Nations favourite birds; to delight at their tumbling, acrobatic flight – a ‘flickering chequerboard’ – wheezing out their peewit call during the spring months and to see large winter flocks gathering together, nearly always on the same fields each year, all hunkered down and facing into the strong, chilling northerly breeze. Richard Jefferies also wrote prosaically about the ‘Haunts of the Lapwing’, in two short essays ‘Winter’ and ‘Spring’. In this first part, he stumbles across some lapwings braving the dreadful weather and the sight of them instantly lifts his spirits. In that moment he finds them to be ‘the only things of life that save the earth from utter loneliness’. Coming like a white wall the rain reaches me, and in an instant everything is gone from sight that is more than ten yards distant. The narrow upland road is beaten to a darker hue, and two runnels of water rush along at the sides, where, when the chalk-laden streamlets dry, blue splinters of flint will be exposed in the channels. For a moment the air seems driven away by the sudden pressure, and I catch my breath and stand still with one shoulder forward to receive the blow. Hiss, the land shudders under the cold onslaught; hiss, and on the blast goes, and the sound with it, for the very fury of the rain, after the first second, drowns its own noise. There is not a single creature visible, the low and stunted hedgerows, bare of leaf, could conceal nothing; the rain passes straight through to the ground. Crooked and gnarled, the bushes are locked together as if in no other way could they hold themselves against the gales. Such little grass as there is on the mounds is thin and short, and could not hide a mouse. There is no finch, sparrow, thrush, blackbird. As the wave of rain passes over and leaves a hollow between the waters, that which has gone and that to come, the ploughed lands on either side are seen to be equally bare. In furrows full of water, a hare would not sit, nor partridge run; the larks, the patient larks which endure almost everything, even they have gone. Furrow on furrow with flints dotted on their slopes, and chalk lumps, that is all. The cold earth gives no sweet petal of flower, nor can any bud of thought or bloom of imagination start forth in the mind. But step by step, forcing a way through the rain and over the ridge, I find a small and stunted copse down in the next hollow. It is rather a wide hedge than a copse, and stands by the road in the corner of a field. The boughs are bare; still they break the storm, and it is a relief to wait a while there and rest. After a minute or so the eye gets accustomed to the branches and finds a line of sight through the narrow end of the copse. Within twenty yards—just outside the copse—there are a number of lapwings, dispersed about the furrows. One runs a few feet forward and picks something from the ground; another runs in the same manner to one side; a third rushes in still a third direction. Their crests, their green-tinted wings, and white breasts are not disarranged by the torrent. Something in the style of the birds recalls the wagtail, though they are so much larger. Beyond these are half a dozen more, and in a straggling line others extend out into the field. They have found some slight shelter here from the sweeping of the rain and wind, and are not obliged to face it as in the open. Minutely searching every clod they gather their food in imperceptible items from the surface. There is another winter resort of plovers in the valley where a barren waste was ploughed some years ago. A few furze bushes still stand in the hedges about it, and the corners are full of rushes. Not all the grubbing of furze and bushes, the deep ploughing and draining, has succeeded in rendering the place fertile like the adjacent fields. The character of a marsh adheres to it still. So long as there is a crop, the lapwings keep away, but as soon as the ploughs turn up the ground in autumn they return. The place lies low, and level with the waters in the ponds and streamlets. A mist hangs about it in the evening, and even when there is none, there is a distinct difference in the atmosphere while passing it. From their hereditary home the lapwings cannot be entirely driven away. Out of the mist comes their plaintive cry; they are hidden, and their exact locality is not to be discovered. Where winter rules most ruthlessly, where darkness is deepest in daylight, there the slender plovers stay undaunted. Forty or fifty years ago the Lapwing, Peewit, or Green Plover, was a regular nesting bird in Britain but ‘advances’ in agricultural practices – land drainage and general intensification – have, lamentably, driven it from traditional farmland breeding grounds. The sad fact is Lapwing numbers have decreased in Britain since the middle of the 19th century. It seems as if the future of the Lapwing is down to us - their rapid decline - 50% since 1983 (CBC/BBS joint trend) - can be reversed by enlightened management of farmland and control of predators. Where farmers and conservationists have worked together then Lapwing and other farmland birds, Grey Partridge, Turtle Dove, Tree Sparrow, Yellowhammer and Linnet ... all at risk, have been shown to stabilise. Their decline halted, at least temporarily. Here’s one example of an award winning farm in North Norfolk which has 20-30 breeding pairs of Lapwing - Abbey Farm in North Norfolk. What is needed to reverse the decline, of course, is a change to agricultural practices on a grand scale - an ‘Agricultural Revolution’! I am lucky here in North Wales: The RSPB are managing some local sites to provide ideal habitat for the existing nesting Lapwing and to increase the current numbers of breeding pairs. Morfa Dinlle – is 117 ha of grazed pasture protected by flood defence walls. It includes wet pasture with permanent pools and shallow seasonal pools, rushy pasture, and some higher ground. The site is on a low-lying peninsula and forms part of a system of grazing marsh and sand dunes extending north towards Anglesey from the mainland, enclosing Foryd Bay, an area of saltmarsh that is designated as SSSI and a Local Nature Reserve. The seaward side of the peninsula has a popular beach, in a picturesque setting with the backdrop of Snowdonia to the east. Cors Ddyga, another designated SSSI, lies within one of the largest lowland wetlands in Wales. The grassland supports one of Wales’ few lapwing colonies and resounds to the song of Lapwing and skylark in spring. The reedbeds are home to otters, water voles and wetland birds: and it is one of the few places in Wales to see Marsh Harrier and Bittern, or to hear the sharp squeal of a Water Rail. Help is on the way - The GWCT is leading a Defra-funded project with the RSPB - ‘Lapwings On Arable Farmland’ - to assess the efficacy of AES fallow plots as a tool for lapwing recovery in lowland arable/mixed farming landscapes. Research is being conducted by the GWCT in Hampshire, Wiltshire and Dorset and by the RSPB in Cambridgeshire and Norfolk. From the bushes by the stile on the left hand, which I have just passed, follows the long whistle of a nightingale. His nest is near; he sings night and day. Had I waited on the stile, in a few minutes, becoming used to my presence, he would have made the hawthorn vibrate, so powerful in his voice when heard close at hand. There is not another nightingale along this path for at least a mile, though it crosses meadows and runs by hedges to all appearance equally suitable; but nightingales will not pass their limits; they seem to have a marked-out range as strictly defined as the lines of a geological map. They will not go over to the next hedge – hardly into the field on one side of a favourite spot, nor a yard farther along the mound. Opposite the oak is a low fence of serrated green. Just projecting above the edge of a brook, fast-growing flags have thrust up their bayonet-tips. Beneath their stalks are so thick in the shallow places that a pike can scarcely push a way between them. Over the brook stand some high maple trees; to their thick foliage wood-pigeons come. The entrance to a coomb, the widening mouth of a valley, is beyond, with copses on the slopes. Again the plover’s notes; this time in the field immediately behind; repeated, too, in the field on the right hand. One comes over, and as he flies he jerks a wing upwards and partly turns on his side in the air, rolling like a vessel in a swell. He seems to beat the air sideways, as if against a wall, not downwards. This habit makes his course appear so uncertain; he may go there, or yonder, or in a third direction, more undecided than a startled snipe. Is there a little vanity in that wanton flight? Is there a little consciousness of the spring-freshened colours of his plumage, and pride in the dainty touch of his wings on the sweet wind? His love is watching his wayward course. He prolongs it. He has but a few yards to fly to reach the well-known feeding-ground by the brook where the grass is short; perhaps it has been eaten off by sheep. It is a straight and easy line as a starling would fly. The plover thinks nothing of a straight line; he winds first with the course of the hedge, then rises aslant, uttering his cry, wheels, and returns; now this way, direct at me, as if his object was to display his snowy breast; suddenly rising aslant again, he wheels once more, and goes right away from his object over above the field whence he came. Another moment and he returns; and so to and fro, and round and round, till with a sidelong, unexpected sweep he alights by the brook. He stands a minute, then utters his cry, and runs a yard or so forward. In a little while a second plover arrives from the field behind. He too dances a maze in the air before he settles. Soon a third joins them. They are visible at that spot because the grass is short, elsewhere they would be hidden. If one of these rises and flies to and fro almost instantly another follows, and then it is, indeed, a dance before they alight. The wheeling, maze-tracing, devious windings continue till the eye wearies and rests with pleasure on a passing butterfly. These birds have nests in the meadows adjoining; they meet here as a common feeding-ground. Presently they will disperse, each returning to his mate at the nest. Half an hour afterwards they will meet once more, either here or on the wing. In this manner they spend their time from dawn through the flower-growing day till dusk. When the sun arises over the hill into the sky already blue the plovers have been up a long while. All the busy morning they go to and fro – the busy morning, when the wood-pigeons cannot rest in the copses on the coomb-side, but continually fly in and out; when the blackbirds whistle in the oaks, when the bluebells gleam with purplish lustre. At noontide, in the dry heat, it is pleasant to listen to the sound of water moving among the thousand thousand grass-blades of the mead. The flower-growing day lengthens out beyond the sunset, and till the hedges are dim the lapwings do not cease. Leaving now the shade of the oak, I follow the path into the meadow on the right, stepping by the way over a streamlet, which diffuses its rapid current broadcast over the sward till it collects again and pours into the brook. This next meadow is somewhat more raised, and not watered; the grass is high and full of buttercups. Before I have gone twenty yards a lapwing rises out in the field, rushes towards me through the air, and circles round my head, making as if to dash at me, and uttering shrill cries. Immediately another comes from the mead behind the oak; then a third from over the hedge, and all those that have been feeding by the brook, till I am encircled with them. They wheel round, dive, rise aslant, cry, and wheel again, always close over me, till I have walked some distance, when, one by one, they fall off, and, still uttering threats, retire. There is a nest in this meadow, and, although it is, no doubt, a long way from the path, my presence even in the field, large as it is, is resented. The couple who imagine their possessions threatened are quickly joined by their friends, and there is no rest till I have left their treasures far behind. There is another Plover, often seen in the company of Lapwing, which in some parts of the country is called the “Whistling Plover” – the Golden Plover. Suddenly I heard some distant whistles that gradually came nearer; I looked up shielding my eyes against the light and there, flying fast, were about three hundred birds in a tight flock, their whistles breaking the silence – Robin Page. A relatively rare bird in North Wales, this moorland specialist is most common on the northern fells. 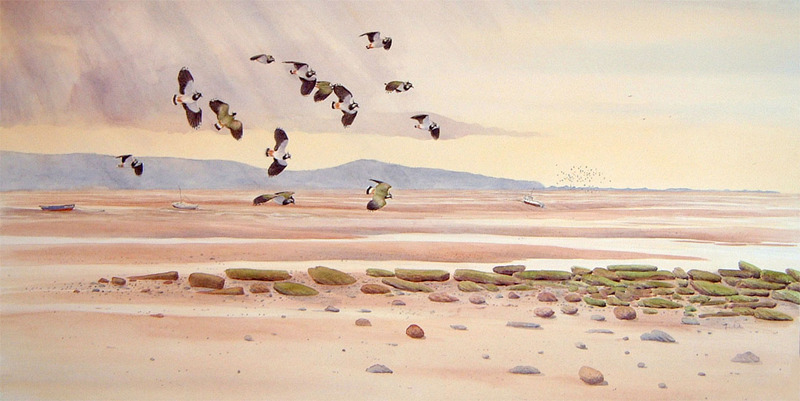 In the winter they move to lowland fields, forming large flocks, often in the company of Lapwing. They occur during Autumn and Winter when they are moving south to avoid the worst of winter’s cold; and we see them again in the Spring when they are moving north to breed on our moorlands and mountains in Northern England and Scotland. In the Autumn they look rather drab – but on their springtime return as they move north they look spectacular in their breeding plumage– particularly in strong sunlight. Then their breasts are jet black making a complete contrast to their golden backs and wings – they must surely rank as one of Britain’s most attractive birds. 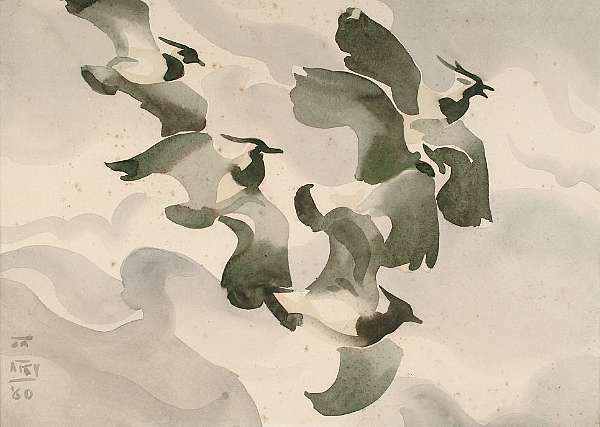 Note: The peewit call of the bird was associated with the legend of the seven whistlers – seven birds flying together by night, whose cries presaged disaster. This call was said to cry “bewitched, bewitched” and so bring evil to those who heard it. their wit with constant repetition”. Thank you for including this, Clive. Thanks Mary. I shall rewrite this post sometime, possibly splitting it into two and would then love to incorporate your lines about the peewit.